Upon acceptance of your order, the memorial tree or park bench will be placed in the park of your choice. The City arborist will choose a tree variety that is best suited for your desired location. The Public Works Department will plant and care for your tree and replace it if it should become damaged or diseased. If you would like to participate in the planting of the tree, the City will provide assistance. 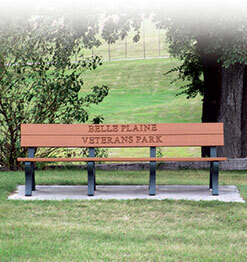 Through the Memorial Bench and Tree Program, friends and relatives can provide a unique dedication to loved ones by placing a tree or bench in one of the beautiful parks of Belle Plaine. This historical dedication provides a lasting remembrance in honor of a loved one and enhances the meaning of a bench or tree to observers. The gift is also a valuable contribution to the park system which is utilized by children, youth and adults. People of all ages visit our parks on a daily basis to enjoy park trails, athletic sports, playground activities, concerts and other gatherings and neighborhood activities. Others come to the parks just to relax and get away from the stresses and pressures of everyday life. Whatever reason for visiting our parks, your generous gift will be recognized and appreciated by the park system. The City of Belle Plaine would like to thank you for your dedication to enhancing our parks with your gracious generosity. The benches consist of a durable composite material with engraved lettering. You may request a specific site for the placement of the bench and the City will endeavor to accommodate your preferred location. The Public Works Department will provide a concrete pad for the bench. Staff will happily assist you with lettering and other details. Trees are 2”-3” in diameter and will be installed by the Public Works Department. The City arborist will choose a tree variety that is best suited for your desired location. An engraved plaque will be placed next to the tree. *Prices subject to change. Please contact City Hall at 952-873-5553 to obtain a current price.